My daughter (like many other girls these days) is glamoured with Monster High. So for her birthday, she requested a Draculaura cake (her face with her ponytails). So, I made her a red velvet cake (my 1st attempt at that!) and had at it. I used 2 layers of a 10″ square pan. Because I had to have a black background for the cake, I opted to purchase the Wilton fondant that was already colored black. I find coloring fondant black takes SO much coloring that for something this large, it’s just worth it to buy it. 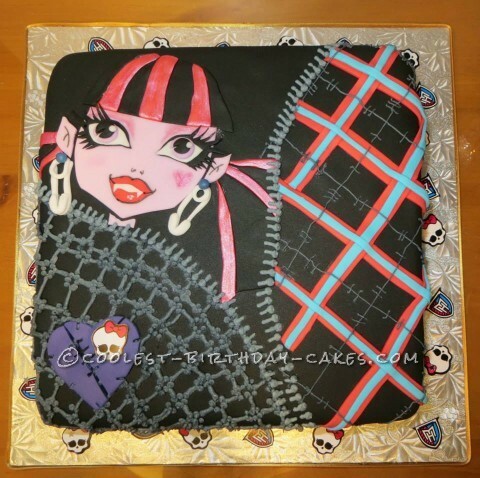 I covered the cake with the black fondant, then started working on the Draculaura part. I found a picture online, put it into a document and re-sized it to fit the cake. I colored some fondant a very light pink for her face, then traced the shape from the document and cut the fondant. I used a leaf shaped cutter for her eyes, then free handed the shape of the black around them with the eyelashes and layered that on top of the face shape already cut out. Then I cut out the hair, added that to the cake then worked on the lines. I just rolled thin strips of fondant for that and cut them with a pizza cutter then laid them on the cake. All fondant pieces were attached using a bit of water on the back to act as glue. I painted a heart on Draculaura’s cheek using a pink pearlized powder/glitter by Wilton that was mixed with a tiny bit of clear vanilla extract. I used that for her eye shadow as well and used the dry powder for a tiny bit of blush on her cheeks. I swear the bane of my existence is coloring fondant hot pink!! So be warned, that can be frustrating. I used butter cream colored grey for the pattern and zipper, which I believe I used a #2 tip for. I sprinkled a little Monster High confetti around the cake for fun too. The girls at the party were fighting over who got to eat her eyes…gotta love girls!